Score 150000 points to complete the level. You just need to get score some and if you already played lot of levels then it wont be hard to complete this level. You should first try to break grills and as you will have big board you can have more chance to break candies and make special candies. You should try to break candies that the Odus owl have and as moon have full power it will break same color candies and it could give chance to make more colorbombs and other special candies that you should try to combine with each other to score more. You shouldn’t forget to balance the Odus owl and try not to waste moves. We completed this level with 695280 score and luckily got 10 colorbombs and get three star points on score. I can’t find any tips for these new levels on dreamland level 47. I’ts impossible to get that many points and get rid of all the bombs.you also loose 2 moves at the end if all the bombs aren’t busted,that is screwed up. Please help!!!!!! 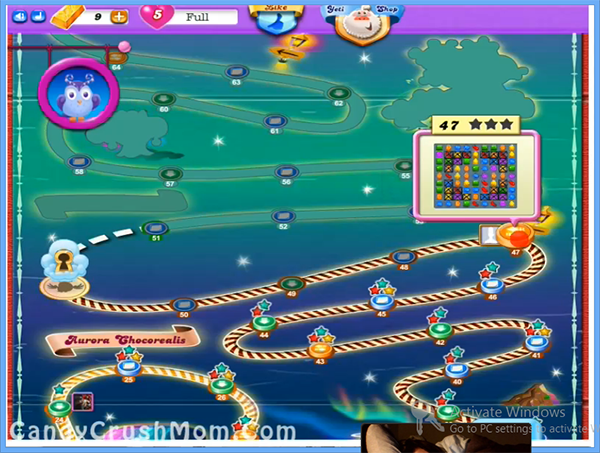 I’ve been stuck for quite a while…read your tips…watched the video…followed the directions you gave and passed it as soon as I went back…THANK YOU CANDYCRUSHMOM!! !